Princess attire is required – but that can be anything from your wedding gown to your ball gown to your royal pajamas and tiara! Guests will have the opportunity to take pictures with Cinderella’s coach – made by the same company that provides coaches to the Royal family – and an English-style breakfast will be served. Also available for viewing will be the newly-released Fairy Tale wedding jewels, as well a collection of princess-inspired gowns by Alfred Angelo. 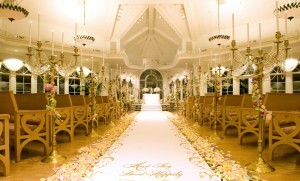 The event will take place in Disney’s Wedding Pavilion, and will, of course, include a screening of the happy event. Join the party from 4 a.m. to 8 a.m. – and stay for the fireworks which will conclude the celebration! To learn more or to RSVP for this free event, please visit Disney Wedding’s Ever After Blog, and follow hashtag #DisneyRoyal on Twitter. Editor’s Note: At this time, the event has reached its registration capacity. However, Ever After states that readers should stay tuned for updates, so it may be possible that organizers plan to add more space due to the popularity of the event. Keep checking the blog if you are interested in attending, and good luck!